ABLE are the exclusive UK distributor of the Canty PharmaFlow, which has been engineered to analyse small volume samples for particle size, shape and concentration. The PharmaFlow easily converts from a lab unit to allow for continuous sampling in-line using sanitary Tri-Clamp connections. 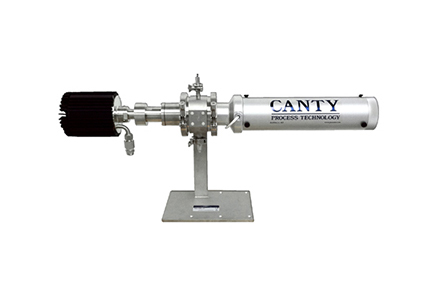 It offers microscopic, non-destructive viewing and provides particle size analysis with two dimensional results when used in conjunction with the CantyVisionClient Software. The vision system, with integral lighting, features precision optics designed to enhance the image prior to display or analysis. The image sensor is a high resolution / high speed CCD camera coupled to a microscopic lens system. The system offers zoom and focus ability, variable lighting, and multiple objective lens packages to cover a range of sizes. The PharmaFlow features the FuseView™ window as the flush product contact barrier which ensures laminar flow & eliminates pockets for potential product build-up. Sizing down to 0.7 micron is possible with the high magnification optics and high intensity light source. A variety of pumps can be used in conjunction with the system, including syringe style injection as well as peristaltic pumps.